For the former NFL and Arena Football League player, see Chris Canty (defensive back). Canty attending a 2014 national campaign. Christopher Lee Canty (born November 10, 1982) is an American football defensive end who is currently a free agent. He was drafted by the Dallas Cowboys in the fourth round of the 2005 NFL Draft. He has also played for the New York Giants, winning Super Bowl XLVI with them in 2011. He played college football at Virginia. 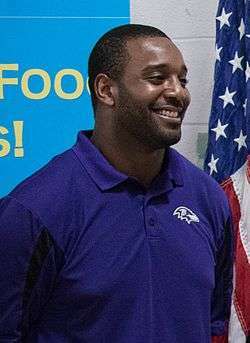 Chris Canty was born in The Bronx, New York. He grew up in the Baychester section of the borough until he moved to North Carolina at age 15. He did not play football until his junior year. Canty helped lead his team (Charlotte Latin School) to the North Carolina Independent Schools Athletic Association State Championship in 1999 on his way to earning All-Conference and All-State honors as a senior tight end and defensive end after recording 20 receptions for 400 yards and 89 tackles and seven sacks. He finished his prep career with 161 tackles, 12 sacks and two fumble recoveries. He was also a two-year letterman and all-conference honoree for the basketball team. While at Virginia, Canty was a two-time second-team All-Atlantic Coast Conference selection. He led all conference defensive linemen in tackles as a sophomore and junior. In 2002, despite missing three games due to injury, Canty finished his sophomore season with 86 tackles, four tackles for losses, four pass deflections, three quarterback pressures, three fumble recoveries and two sacks while starting eight-of-11 games. In 2003, Canty was named second-team All-ACC, Lineman of the Year in Virginia and recipient of the Ned McDonald Award as UVA's Most Outstanding Defensive Player after registering a career-high 104 tackles, 12 tackles for losses, 12 pressures and four sacks. He became only the second down lineman in school history to record more than 100 tackles in a season. His schoolwork also helped him earn All-ACC Academic honors. In 2004, he received his bachelor's degree in African American studies in May and took graduate course work in secondary education during his senior year. Canty's season was cut short in the fourth game of the season when he tore his ACL, MCL and PCL in his left knee. At the time, he had posted 30 tackles, seven tackles for losses, a sack and a forced fumble. Canty suffered a serious eye injury at a nightclub in Scottsdale, Arizona, in late January 2005. While Canty said he was nothing more than a bystander in an altercation, he evidently was hit with a glass bottle in left eye, forcing him to have immediate surgery to repair a detached retina. Canty was drafted in the fourth round (132nd overall pick) of the 2005 NFL Draft by the Dallas Cowboys. After entering his senior season as a potential first round draft choice, he fell because of the knee injury he suffered as a senior, as well as a detached retina in his left eye, that was inflicted in the spring prior to the draft. The Cowboys traded their fifth round pick in 2005 and a fourth rounder in 2006 to the Philadelphia Eagles in order to move up. Canty signed a three-year, $1.3 million contract with the Cowboys. After working throughout the spring and summer to rehabilitate his knee and recover from the injured retina, Canty was on the field one week into training camp. As a rookie he registered 35 tackles (24 solo), was second on the team with five tackles for loss and tied for fourth on the club with 2.5 sacks. Canty played in the season opener at the San Diego Chargers and recorded his first NFL tackle along with a quarterback pressure. Against the Washington Redskins he added his first career sack with a third-quarter tackle of Mark Brunell. He was third on the team, first among linemen with a season-high six tackles at the Oakland Raiders. He also added a half sack and a tackle for a loss. Canty had two tackles against the Philadelphia Eagles as the defense limited the Eagles to 129 total yards, including just 19 on the ground, the fourth lowest rushing total in franchise history. Canty had a season-high two quarterback pressures against the Arizona Cardinals as well as a tackle and a tackle for a loss. At Philadelphia, he played mostly on first and second downs, recorded two tackles, a tackle for a loss and a forced fumble. Canty led all linemen with three tackles and added his second sack of the season against the Denver Broncos. At the New York Giants, he earned his first NFL start, replacing (Greg) Ellis at right end, and recorded four tackles. He started, again, the next week against the Kansas City Chiefs and led all defensive linemen with five tackles despite suffering a sprained ankle during the game. He did not start but did play at Washington after missing two days of practice due to the injured ankle. He recorded two tackles and a tackle for a loss at the Carolina Panthers. In the season finale against the St. Louis Rams, Canty led all defensive linemen with five tackles and also had a tackle for a loss. In 2006, the team moved to a 3-4 defense and Canty earned the starting role at right defensive end. He went on to start all 16 regular season games and Dallas's lone playoff game. He recorded 33 tackles and 1 sack. In 2007, he registered 43 tackles (30 solo), 3.5 sacks and 2 passes defensed. In the Cowboys lone playoff game, their third game against the New York Giants on the season, Canty registered three tackles (two solo), one sack and one pass defensed. After the Cowboys made the decision to give a five-year extension to Jay Ratliff, on June 11, 2008 season, Canty signed only a one-year tender offer worth $2.017 million to remain with the team. He started all 16 games for a third consecutive year, producing 37 tackles (25 solo), 3 sacks and a career-high 5 passes defensed. On March 1, 2009, Canty signed with the New York Giants; the six-year contract is worth $42 million, with $17.25 million guaranteed. He was named the starter at right defensive tackle in then team's 4-3 defense, but missed eight games with knee and hamstring injuries. In 2011, he registered career-high marks in tackles (47) and sacks (4). On August 27, 2012, Canty was placed on the physically unable to perform list after it was determined he would need more time to recover from off-season knee surgery. On October 20, he was activated off the PUP list. On November 2, he was fined $15,750 for roughing the passer. Canty suffered a sprained MCL on December 23, against the Baltimore Ravens and missed the season finale. After playing in only 9 games he registered 25 tackles (20 solo) and 3 sacks. He was released on February 6, 2013, in a salary cap move. Canty signed as a free agent with the Baltimore Ravens on March 12, 2013. He registered 30 tackles, 2 sacks and 2 forced fumbles, while playing left defensive end in then Raven's 3-4 defense. In 2014, he missed five games while battling ankle injuries and a staph infection in his wrist. He was cut by the Ravens on February 27, 2015. The Ravens then signed him again on March 18, 2015. Canty's mother, Shirley, is an ordained United Methodist minister, his father, Joseph, Sr., is retired. One of his brothers is the president of Chris's foundation and the other is a college football coach. It has been stated by Canty that his all-time favorite movies are Independence Day and Home Alone 2: Lost in New York. ↑ "Canty had retina detached". dallascowboys.com. Archived from the original on 2007-12-22. Retrieved 2007-11-17. ↑ Youngmisuk, Ohm (August 27, 2012). "New York Giants shelve Chris Canty, Travis Beckum amid recoveries". ESPN.com. Retrieved 2012-09-03. ↑ Vacchiano, Ralph (October 20, 2012). "NY Giants activate Chris Canty off the PUP list, could give struggling defensive line a boost vs. Washington Redskins". NYDailyNews.com. Retrieved 2012-10-22. ↑ "Fines roundup: Richard Seymour docked for hit on Matt Cassel". National Football League. 2012-11-02. Retrieved 2012-11-02. ↑ "Giants' Canty Suffers Sprained MCL". CBS News New York. Retrieved 24 December 2012. ↑ "Giants Release Running Back Ahmad Bradshaw, Defensive Lineman Chris Canty". CBS News New York. Retrieved 6 February 2013. ↑ Hanzus, Dan (March 12, 2013). "Chris Canty, Baltimore Ravens reach three-year deal". NFL.com. Retrieved 2013-03-12.